We were up bright and early at 4:15am to be ready for our bus pick-up at 4:50am. Again, I heard that bird this morning that sings through the night, or really early in the morning. I think it was the same bird, but this one had more of a song like the Hunger Games mocking jay. I recorded it and found out it’s a pied butcherbird. Hopefully this video works. It’s in the dark and apparently they only do this at night when they are mating. The birds along the Larapinta are supposed to be eccentric and really beautiful compared to anything I’ve ever seen and I’m really excited to capture some good photos of them. I just don’t know that I can take a bird song like that throughout the night with how light a sleeper I can be. I didn’t anticipate this challenge and may be needing my earplugs. It was a 3hr drive to Kings Creek Station where a nice hot breakfast was served. There wasn’t a sunrise because it was cloudy and sprinkling, but it was still beautiful out there. 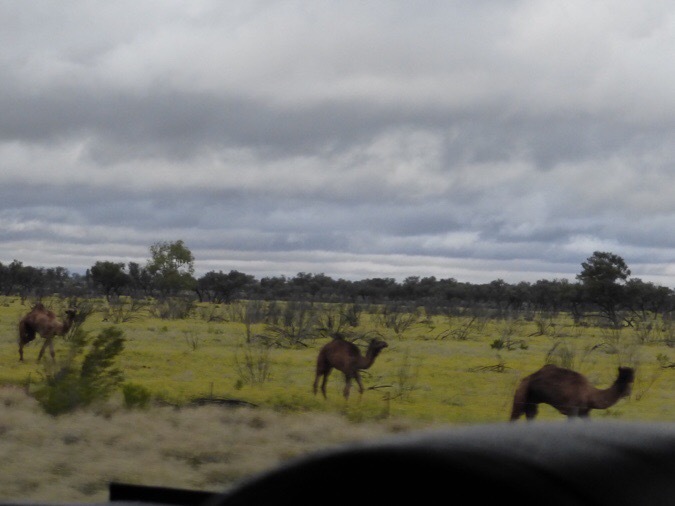 We saw wild camels! I was somehow wide awake in the dark bus, so I listened to an audiobook I started on the flight over here. It’s called, “Te Araroa The New Zealand Trail: One Man Walks His Dream” by Geoff Chapple. It’s about how the Te Araroa came to be. Buck-30 did the TA in 2011 when it was first being done and absolutely loved the unknown adventure of it. Since then, some hikers (particularly Americans) have come away from the TA disappointed or unsatisfied with the route. Many skip sections or choose alternates or alternate ways to travel like kayak or biking. Buck-30 gave me this book months ago so I could have a greater understanding and appreciation for how the TA came to be and why it goes where it goes. We Americans tend to take for granted the trail system we have and the value our government has placed on preserving such areas. It isn’t like this around the world and that’s why it’s so difficult to find long walks over 1,000mi long in other countries. I really want to read this book, but I’m a terrible reader and don’t enjoy reading. It doesn’t come in audiobook format, but I found that when it’s on the Kindle app on my phone, I can use the iPhone speak feature to have it spoken to me. It’s slightly robotic, but does the trick. I even set the voice to that of a New Zealand male to make it even better! I have to say I am glad to have this history lesson before doing the TA and I do think it will give me a greater appreciation for the trail when I get over there in November. I’ll elaborate more on what I’ve learned when I hike the TA. Back to today. Breakfast was at Kings Creek Station. These stations are rustic areas for refueling and food can be prepared for large groups as well. There is also a small convenience store for snacks and such. I’m very happy I chose to do the tours. 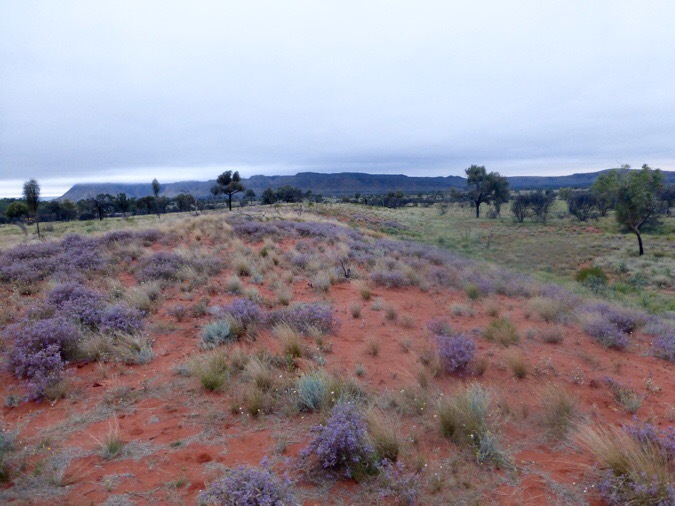 This is my first time doing this type of travel, and though it isn’t ideal, it is a relaxed way to experience the Red Centre area while also getting me closer to the the start of the Larapinta. This leg of the trip was on the AAT Kings tour bus, and it was huge. 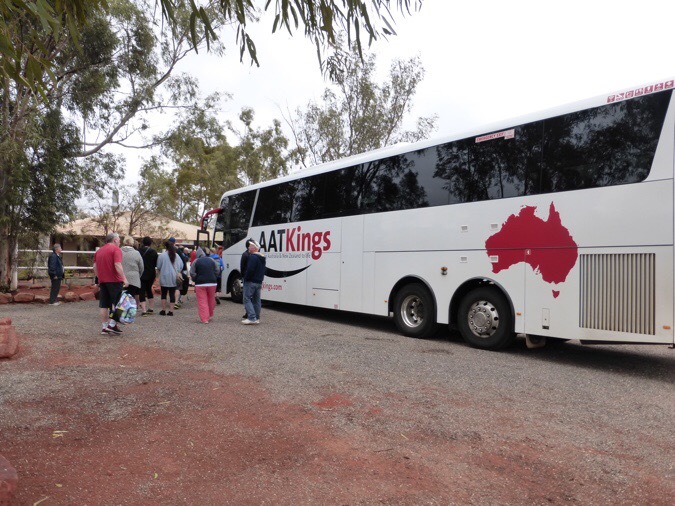 I have to say from my experience, the AAT Kings tours seem slightly higher caliber than the Emu Run Tour we did yesterday, but I think it greatly varies given the personality and energy of your tour guides as we had different ones each day. 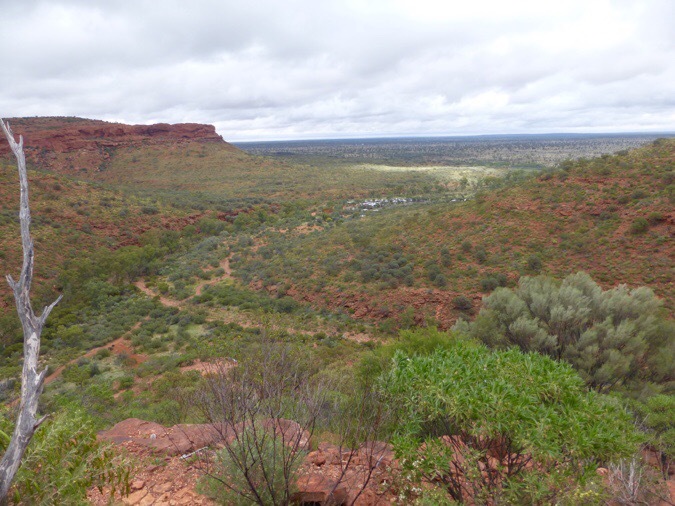 After breakfast, it was a short drive to Kings Canyon and a 4.4mi/7.1km walk. Weather was pretty darn great with cool fall-like conditions and sprinkles every so often. I love clouds with these rocky hikes as I feel Iike sunlight makes the rocks too bright. This was just right, and it was also cool enough out that the group of 19 of us got to do all the bonus side views as well. 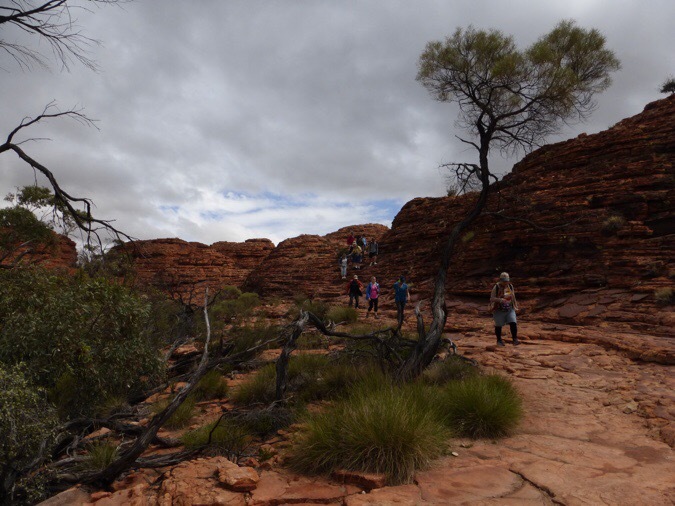 Kings Canyon is quite beautiful and I enjoyed the three hours we got to spend doing the Watarraka Rim Walk and The Garden Of Eden. Some in the group chose a less intense lower hike but most did this one. I was mostly with Lindsey and Vanessa who I roomed with last night. 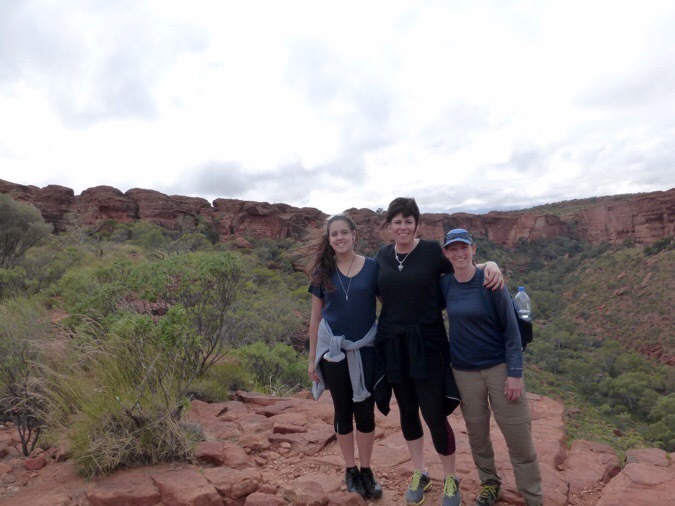 Vanessa’s mom chose to do the other hike. I actually offered to carry the backpack with all our water since I didn’t have a daypack (my pack is crammed with all my gear) and was happy to have somewhere to carry my things. There is a 500ft/150m climb to get up on top and then it was pretty level the rest of the way on top. I was especially happy that it was pretty much a loop hike and we weren’t doing an out and back. Heading up to the rim. View towards the parking area. Made it to the top with Ashley and Vanessa. I’ll take this opportunity to say that Ashley has been living in Alice Springs working at the casino while getting her education in hotel management. I asked her to explain more about why Alice Springs has such a high Aboriginal homeless population. She said it’s not like that in every town, but Alice Springs is where many live that have been kicked out of their community for alcoholism and the majority of them are extremely alcohol dependent. One thing I’ve yet to mention is the fuel I buy for my alcohol stove. It’s called methylated spirits and it’s sold in most basic grocery stores, but it’s kept behind the counter because so many try to drink it. They have even added some purple chemical to it so people won’t drink it, but I guess they still do and it can get stolen often if it isn’t behind the counter. Here at the Kings Canyon store, it’s the exact same bottle, but clear. 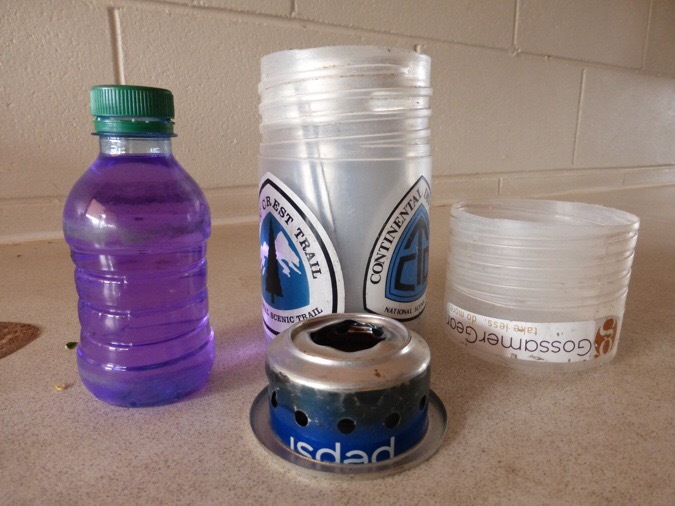 I’ve yet to cook with it, but if I hadn’t heard from other hikers that’s what to use for cooking alcohol, I wouldn’t have known it was ok.
Purple colored methylated spirits for my alcohol stove. 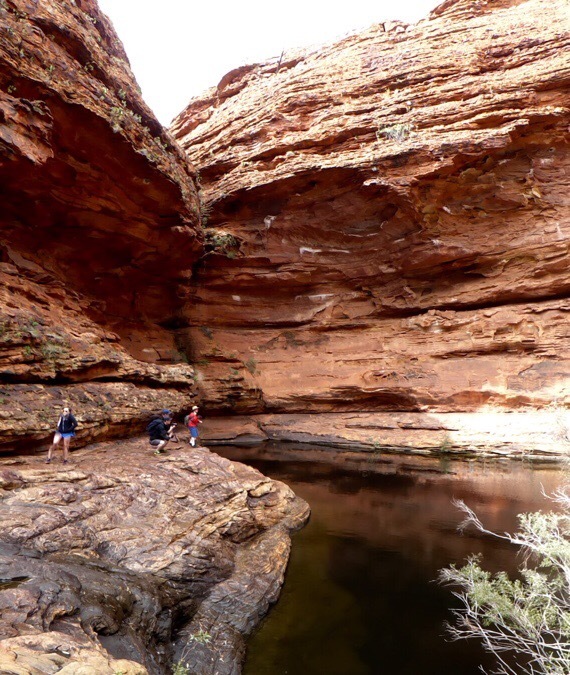 Back to Kings Canyon. 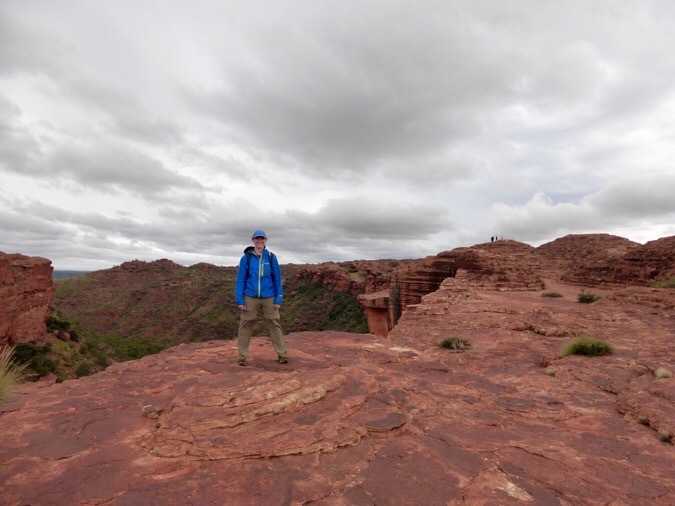 It was a great hike and really great for people to get such a varied experience on an accessible and moderate hike that is just the right length. Here are some photos. Again, this green and all the wildflowers are very unique. This area has had more than double their annual rainfall and haven’t even had their rainy season yet. It would normally be quite hot out here and it feels like fall. Very lucky on this rare weather and climate that is going to continue through the next week as I hike the Larapinta. My favorite flower so far, the mula mula. 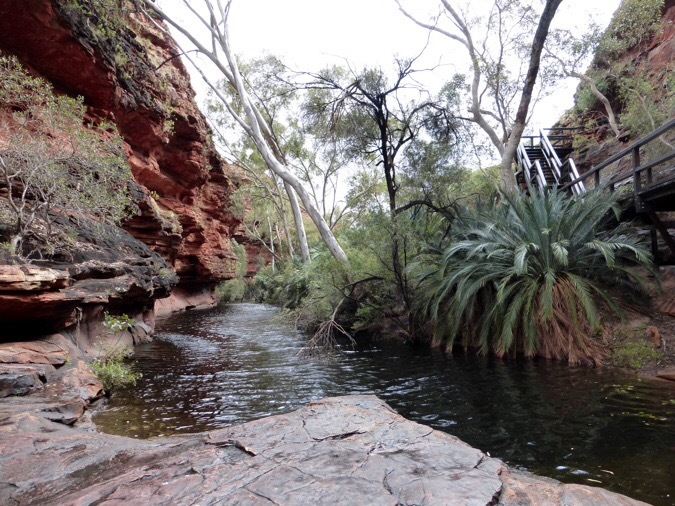 Water hole in Garden of Eden. Other side of the horseshoe path. We came up that far side. We were done around 12:30pm and headed a short distance more to Kings Canyon Resort where there is a gas station, grill, convenience store, campground, and hotel. 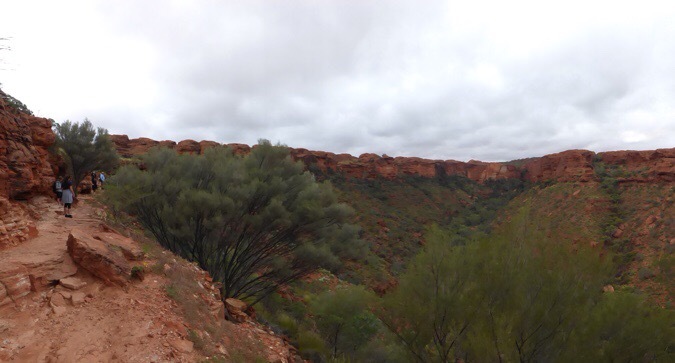 My goal was to eat and then see about a possible ride today or tomorrow to Redbank Gorge (off the Mereenie Loop) to start the Larapinta. For those that would like my nifty diagram again, here you go. I’m on day two of this plan. 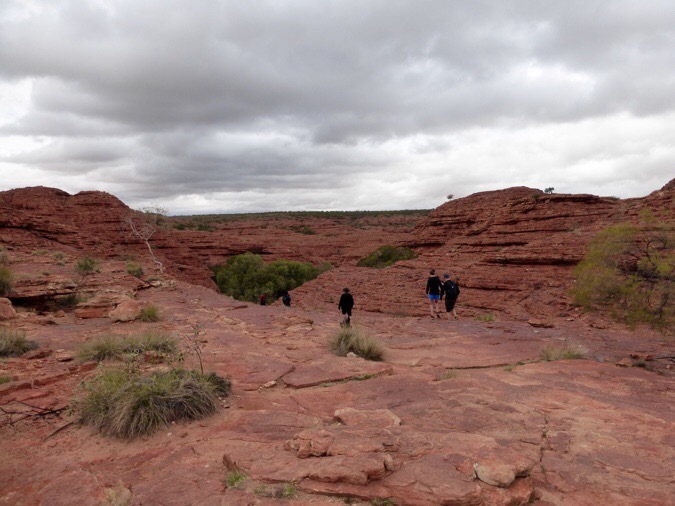 I said goodbye to the tour group and Ashely, Vanessa, and Lynn (they are headed back to Alice Springs) and set out to find a ride from anyone doing the Mereenie Loop. I was greatly relieved to see a ton of traffic coming through Kings Canyon and many in the campground as well. Everyone I asked gave me more confidence that many are heading that way despite the rains that some say can make that road impassible. Apparently, since it’s just been short spurts of sprinkles, it isn’t negatively affecting the road conditions. As I walked towards the campground next to the gas station to ask people, I asked a few people as they drove up to the gas station. None were headed my way, but they said there was plenty of traffic as they had gone thorough. I walked through the campground and the second family I asked was headed that way tomorrow morning! They weren’t sure because of the rain, so I looped the whole campground, which was just half full that early in the day, and no one else was going that way tomorrow. One was, but had no room. I returned to the family and they agreed to take me saying that unless conditions drastically change overnight, they should be out by mid morning. Sweet! It seems that this is really going to work out. Oh man, I can’t believe it! I’m in a definite groove I’m going to do my best to stay in. I forgot to get a group photo before they turned in for the night. 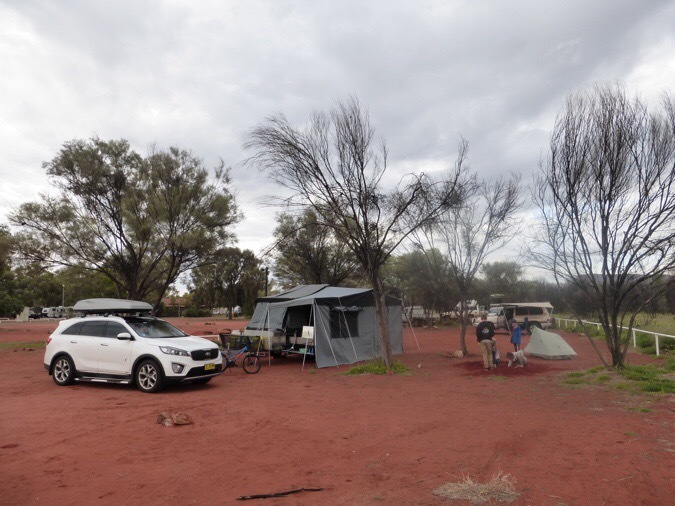 Camp for the night with the family that’s taking me to the start of the Larapinta, Redbank Gorge. The couple has 10yr old fraternal twins that were riding bikes and playing with other kids they’d met at other places they’ve been. They were having fun digging a huge hole near my tent in the hopes of capturing a dingo that was walking around. Dingos are basically wild dogs I’ve yet to get a photo of. It’s funny because instead of “don’t feed the bears” signs, all the signs here are about not petting or feeding the dingos. Apparently, they can get quite aggressive. I had left my tent for a bit and came back to this cute note in my tent door. Gotta love kids! 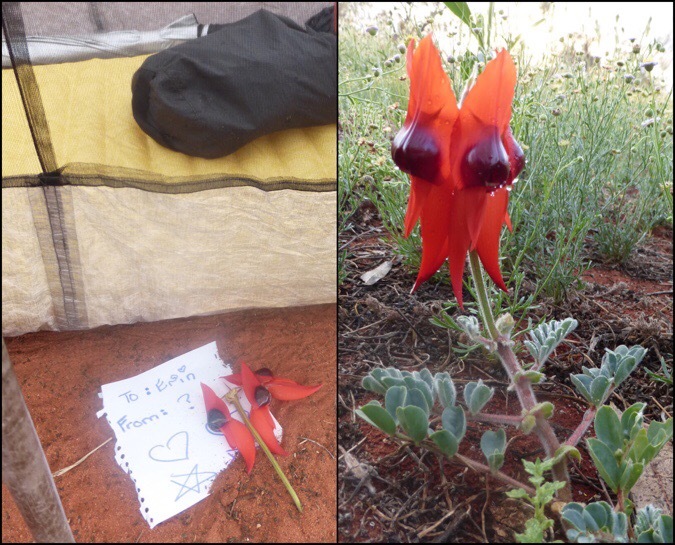 Note with a desert pea and one in the garden for a better perspective. What another great day. It was great to have the ride arranged and be able to do my chores the rest of the day. Wifi was really expensive, so I couldn’t get the blog post up. 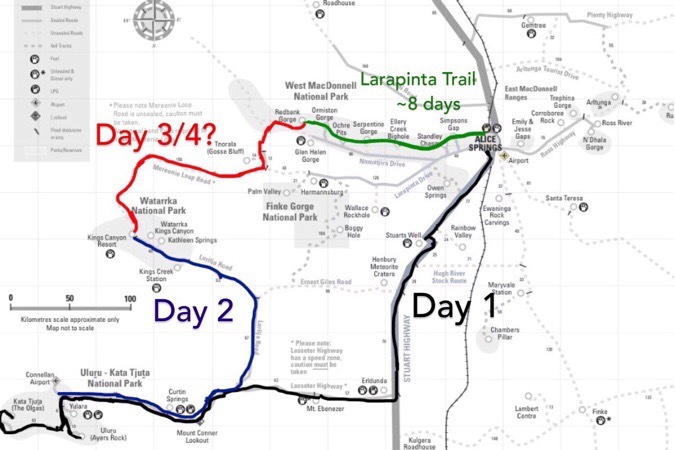 I had little repairs and organization to be done with gear and looked at the Larapinta guide book in more detail for the next couple days. I even got one last shower in before I take off for 9 days. I am quite tired and crashing before 9pm. Back to hiking tomorrow! Evening view from the viewpoint behind my tent. I assume you have read Nancy’s blog from when she did the TA? And you know the Meryl Streep line “The dingo took my baby”. From the actual event that took place at Ayers Rock? Movie was A Cry in the Dark. For years the mum wasn’t believed, but finally when the little sweater was found they ruled that the dingoes indeed ate the baby. We have cloudy and overcast here in So Cal.. even a tiny bit of rain yesterday. I LOVE Elaine! If you haven’t seen it, VEEP is awesome! I heard she just won the Emmy again for that role as well. It is one I can always sit and watch whenever I come across it. Yes, I read WN’s journal knowing I’d be going no and she’s my main contact when I have questions. We talked about it plenty in our weeks together this summer as she has also done lots of the side trips I hope to hit. I even have her journal saved offline on my phone as a resource as I hike! Of course! Couldn’t be better since you have hiked with her and know what she really does and likes and where you and she differ in preferences. Two of my favorite bloggers, for sure. Sooo happy everythings working out great for you.. such a fun trip and one ppl dream of only doing.. your livin the dream !! I’m totally going to have to look for that choc milk. I haven’t gone too far in trying new things. Did some crumbed chicken last night and tried a dark gravy sauce that had garlic I didn’t like and the chicken was too flat and crunch for my liking, but I tried. I did have the hearty breakfast and liked that, but the hash browns were more like tater tots. Love the flowers! I had to buy “meths” for my stove in NZ, too. It’s exactly the same stuff as our “denatured alcohol”. They use it for housecleaning and it’s in lots of grocery stores. I agree on Milo. Since it’s a powder, it would be great for trekking. Congrats on the easy hitch! I’m excited to get rid of that purple stuff and get the black soot off my pot. I hear the clear stuff doesn’t burn as crazy or leave marks like that. Pretty and different flora. Sounds like an interesting trip so far and glad the tours are enjoyable. So many new things to enjoy. E-it all looks so beautiful, can’t wait to hear more. We’re cheering you on from pdx. Hugs! 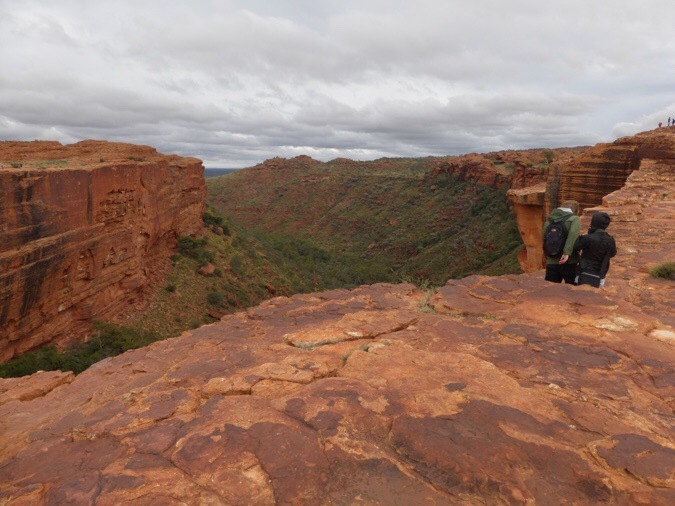 The views into Kings Canyon and the Garden of Eden are stunning. I love red rock and that lovely desert. It is so rad that you’ve had a little rain to green the place up so much. 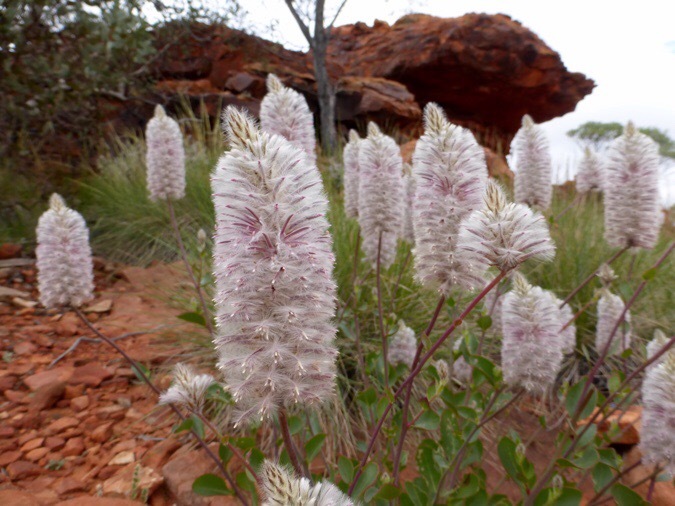 Really glad you are in your groove, hope it continues throughout the whole Larapinta Trl. Have fun! Good luck. Did larapinta in July. Awesome. One suggestion. Do a quick early morning side trip through Ormiston Pound. If you’re transiting through Sydney and need somewhere to crash for a night or three my Family and i would love to have you. Make a change from Hostels. Thanks, I did that whole pound loop and felt like it was a repeat and I should have just done the canyon part. Thanks for the Sydney offer. I have a cousin there and am going to try to get a long layover on my Auckland flight in Nov.
Wow. I Love the rocks, the flowers and the bird call! The bird kinda freaked out my dogs, however! 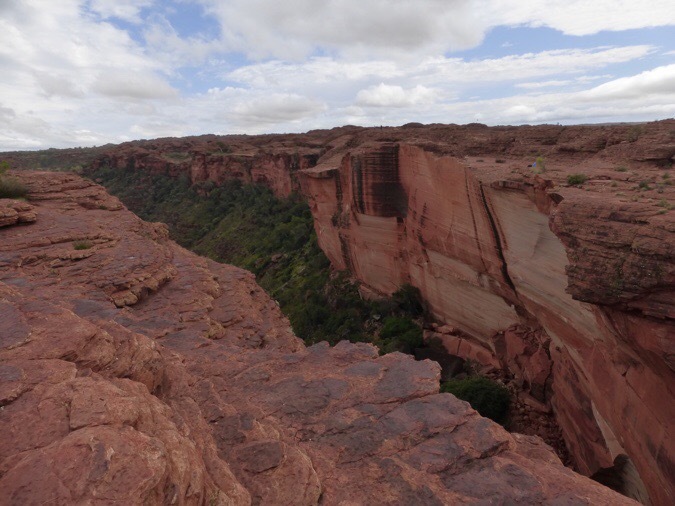 I loved Kings Canyon when I saw it in the 70’s. The roads weren’t sealed then and our bus got bogged in the sand. So glad you found a lift and I just love your final photo. Yes, meths is what we have in England.. it is fine for cooking, but only the truly desperate would try to drink it .. tastes & smells foul, and will eventually kill you. The mula mula flower is so interesting! And I loooove the desert pea, wow! Yep! I also listened to the audiobook and enjoyed that even more.